Morning, peeps! Today my guest reviewer, Claire Knight – is sharing her thoughts on Killing Dr Watson by Matt Ferraz! Grab a cuppa and have a read! I expected Killing Dr Watson to be a whodunnit murder mystery kind of book. Little did I know I was in store for something rather different. I felt the whole story was a bit of caper; who would want to go round killing actors who had played the most famous literary sidekick? Über fan Jerry thinks he’s onto a serial killer who is on the loose, bumping off the co-stars of Bartholomew Neville who played Sherlock Holmes. So he enlists Neville to find the killer. I really didn’t take to Neville, quite possibly the author’s intention. He was portrayed as your a-typical pompous star who has got too big for his boots. Jerry is a bit of an odd character; he seems to make decisions on the fly. Not small decisions like tomato ketchup or brown sauce on your bacon butty (brown sauce of course, no contest!). These are slightly bigger decisions like turning up late for work when you’ve already hacked the boss off for not working the previous day. This is definitely nothing like I’ve read before. It’s a caper crossed with a murder mystery mixed with a bit of a conspiracy thriller. 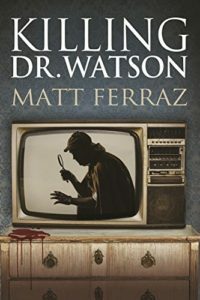 Many thanks to Matt Ferraz and CrimeBookJunkie book blog for my copy of Killing Dr Watson. Thank you Claire for your guest review! If Claire’s review has your interest piqued, you can grab a copy via the link below or head over to amazon when you get a chance! This entry was posted in Book Reviews, Guest Reviews and tagged #CrimeFiction, #GuestReview, #Mystery, #Suspense by crimebookjunkie. Bookmark the permalink. Hey, this is Matt! Thanks for your honest review, I really appreciated it!